Made in 14k yellow gold our INRI crucifix pendant is masterfully crafted with detail and a unique design that is rarely seen on traditional crucifix necklaces. Crucifix measures approx. 1 3/4" tall (2" tall with hoop/bail) x just over 1 1/16" wide. "For I through the law died to the law that I might live to God" (Galatians 2:19). View our collection of unique quality Gold Crucifix Pendants. 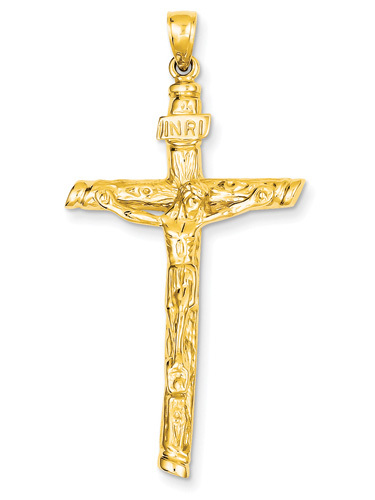 We guarantee our INRI Crucifix Pendant in 14K Yellow Gold to be high quality, authentic jewelry, as described above.